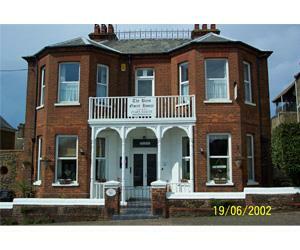 A warm and friendly welcome awaits you in our exclusive 5-star Gold Award, Victorian guest house. We have well equipped rooms and our new therapy room offers relaxing treatments during your stay. Enjoy breakfast or a home-cooked evening meal (by arrangement) in the elegant dining room. Close to beach, town centre and Norfolk’s attractions. Breakfast award. Two minutes walk to town centre, bus station, theatre and other facilities. Two minutes walk to the beach, swimming pool and seaside activities. Close to bars and restaurants. Children welcome from age 12. Follow the A149 from Kings Lynn, go straight over at the Hunstanton roundabout, take the first turning on the left, follow the road and take the third turning on the left into Avenue Road. The Bays is the first house on the right, the car park is to the side of the property. From Hunstanton bus station-walk towards the church on the opposite side of the road, follow the road and take the first turning on the right into Avenue Road, The Bays is the first house on the right.